Great piece, an employee for a Hollywood movie studio in the 1950s was a very serious autograph hound. Obtained at the time, this is signed and inscribed to the niece of this person. 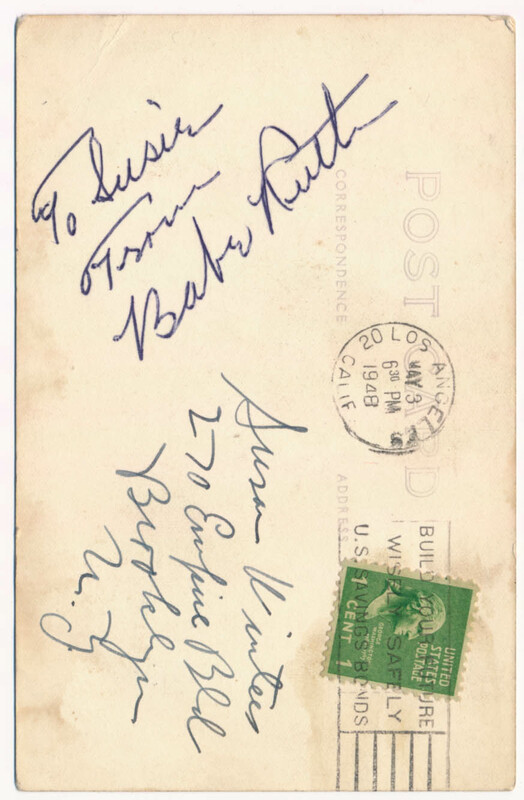 Postmarked in 1948, this is very special as Babe died just over two months after this was signed. Signed To Susie from Babe Ruth, this is a large and perfect signature. Ruth signatures from 1948 are almost always secretarial, this fresh piece is simply outstanding and would be a great addition to any serious Babe Ruth, baseball HOF or Yankee autograph collection. JSA LOA (full).